A lot of my work is about responsibility and lovingkindness toward ourselves and the natural world… at the same time. Despite our habit of seeing “nature” and “people” as having opposite interests, this human/natural world is a co-evolved reality which we share. The “wilderness” over the next ridge may be getting logged – or getting saved. We need to think hard about that. But wildness is a quality you cannot lose. Wildness is your birthright, like God’s love or the act of breathing: A wholly different kind of Paradise. That’s what Paradise Wild is about – our vivid unbreakable connection to nature. It’s what animates our dreaming and waking mind, courses through our bodies, and even shows up in our most civilized and urbane doings. Patterning – inventiveness – discovery – the wild snap of smart hominids manipulating their world and each other. Because I’d like to challenge the way we misapply the “myth of Eden” to the natural world, especially here in North America. You know the story: how the pristine, untouched, virgin Eden got ruined when Europeans showed up: and now it’s all been lost. Eden-grief and nostalgia become the primary feelings we attach to nature. Except that this Paradise-continent was already rather heavily “touched” when Columbus got here, and had been for thousands of years. The “virgin land” idea is a weird imposition on a complex, heavily managed human and natural landscape. Nature and human intermixed, layered, strata upon strata. Once we recognize that Eden is not “lost” – that we are not trapped on the wrong side of Paradise – that nature is not “ended” – then we can get to work fixing our mistakes. Doing a better job of living as part of the wild, amazing natural world. 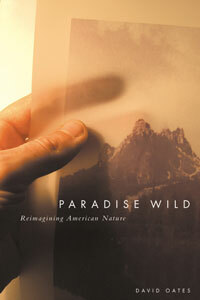 In Paradise Wild, I have drawn from my own life, and tried to reflect on what nature means to me – to other nature writers and scholars – and to American culture as a whole. So it’s partly a personal story, a funny/sad tale of how I took myself into the mountains for refuge, a gay boy raised in a Fundamentalist household, trying to establish myself in the macho world of mountaineering. The ways we use nature to define gender; the ways we misunderstand each other and the natural world; the ways we keep reading into “nature” exactly what our culture projects there… these are the subjects I explore. I find that others were there before me, adding to the layering: my long-lost great-great Uncle William Bartram; John Muir; Edward Abbey; Terry Tempest Williams – their works are as much of what we mean by “nature” as are the mountains and plains themselves. Somehow, all of it layers together, and makes a rich palimpsest, a trail, a wild patterning we never get to the bottom of. Read excerpts from Paradise Wild.